But I don’t have a media degree… | One year, one job. So maybe my uvular fricative articulation isn’t my most employable trait. Before you ask, I speak conversational French and basic Spanish. And no, that has nothing to do with my degree. I learn about the concept of language: how different people use it, the history of it and the science of it. Right now I’m taking one course learning about software for dealing with statistics in linguistic data collection and another reading papers about set theory and predicate logic. It’s a quirky degree, and most of the time I find it pretty interesting. But do I want to continue my study of Linguistics after I get my Bachelors? I want to work in digital marketing. And before that, I had my heart set on a journalism career. So why did I put myself through three years of phonology, sociolinguistics and syntactic trees? Because, three years ago, I wasn’t sure exactly what I wanted to do. And I didn’t want to spend three years doing a very specific media undergraduate degree to end up wanting to be something completely different. I chose my degree because it interested me, not because I wanted to devote my life to it. And now, as I approach the halfway point of my final semester, I’m glad I did. Studying linguistics has meant that I’ve had to commit my own time to my media activities. I’ve had to put the effort in and had to assure myself that I was investing my time (and sometimes money) into my activities because I knew that was really what I wanted to do. Alongside my studies I’ve had to seek out my own internships to fit around my lectures, I’ve sought out writing jobs and I’ve maintained blogs. I didn’t do all this because it was part of an assignment, I did it because it was something I was passionate about. Last week I went to the (highly recommended) Manchester Digital Talent Day and attended a great CV clinic there from the MD of Orchard (a recruitment agency for people wanting careers in digital, creative and marketing roles) who asked us all what we were studying. Everyone in that room was studying a specific career-targeted degree – in fact I think most people at the fair were – and my answer of “Linguistics” was met with a semi-bemused look and quickly brushed over. I was told to reduce the mention of it on my degree and push my work experience. I appreciated this advice a lot; I know that whilst I might love linguistics, employers are less likely to share my joint love of digital marketing and the morphological structure of Pama-Nyungan languages. Because I want others who are deliberating their university options to know that a creative job can be obtained after acquiring any degree – or none at all. Sure, those with specific digital marketing degrees might have more knowledge of the subject and placement years included in their program structure, but that doesn’t mean they are guaranteed a job. Nobody is. If you choose to study linguistics – or history, or quantum physics – you still have just as good a shot at starting your dream media career. It was work experience that got me to the fortunate position I’m currently in. Work experience, and a bit of effort. Though that’s not to discredit the data handling, communication and presentation skills I gained from my studies. Juggling uni work with outside media interests might not seem like the best route for prospective university applicants, but retrospectively I wouldn’t have had it any other way. I’m definitely not knocking those more career-focused degrees (I often see tweets from the MMU digital marketing folks and envy their study options and inspiring lecturers), but there are many different routes into careers such as digital marketing. 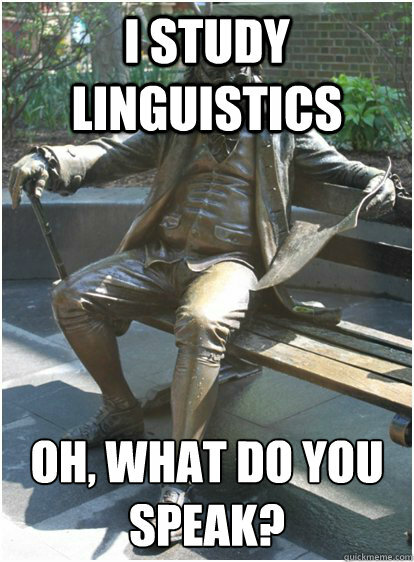 And I’m happy that Linguistics has been part of mine. I think I may write more about the alternative options for people with more traditional degrees (NCTJ, Postgrad study etc). Would people be interested/care to share their experiences?